Everytime I visit Slovenia (basically yearly since I met Nik), it starts the same way. I catch up with Nik, as we don’t write each other unless we are going to each other’s country, and then we join his two best friends Uros and Matej. This time was not different and started the same way, with the usual question: “What do you want to do in Slovenia?”. And the answer is always the same “Don’t know, what do you propose”. That’s when the funniest process starts. All three of them start talking (but it looks closer to arguing) in Slovenian, and then, when they reach a conclusion, one of them translates. Of course, the translator adds a bit of his opinion, what causes a new five minute discussion about the smallest details, like the exact amount of kilometers to this and that place, or how many minutes are enough for each visit. Last year I wanted to see some famous caves, not Potoj, but another one that it’s also a Unesco World Heritage Site: Škocjanske. This one is not as touristic, and definitely not with a train. Due to the traffic I wasn’t able to go, but this year we succeed. It was impressive. The ticket is a bit pricey, but definitely worth it. It’s not allowed to take pictures, and they claim that it’s for safety reasons. I really enjoyed the visit, seeing the undersurface river and the different rock formations. It’s nice how they keep the cave accessible and at the same time maintaining as much as possible the natural formations. On the way home we tried to see a lake, that was not there. I mean it was there, it´s an intermitent lake and then it was empty because of this year’s draught. The next they Nik had to go a symposium in Austria, so Uros was in charge of keeping us entertained. He is a mountain guide, so we went with him to the mountains. I proposed to go to Triglaud (the tallest mountain in Slovenia), but he said it was too touristic and that he would choose a better place. Goiznabar decided not to come, as his knee hurts a bit, so he wanted to rest, and finish editing some videos. He missed one of the most amazing days of the trip! We went to a mountain (fdgsdyhstryh) a bit less than 2000 meters high but lots of fun and exciting to get to. We didn’t go through the normal path, as Uros said it was boring, and then we had to wear our bike helmets to climb the last part. Some parts fell just a bit risky, but Uros knew what where he was taking us, and with our helmets we felt completely safe (in Slovenia if you are not wearing your helmet, they might charge you for rescuing you, for not having the appropriate equipment). We crossed sees of pine bushes and climbed with our hands some places. 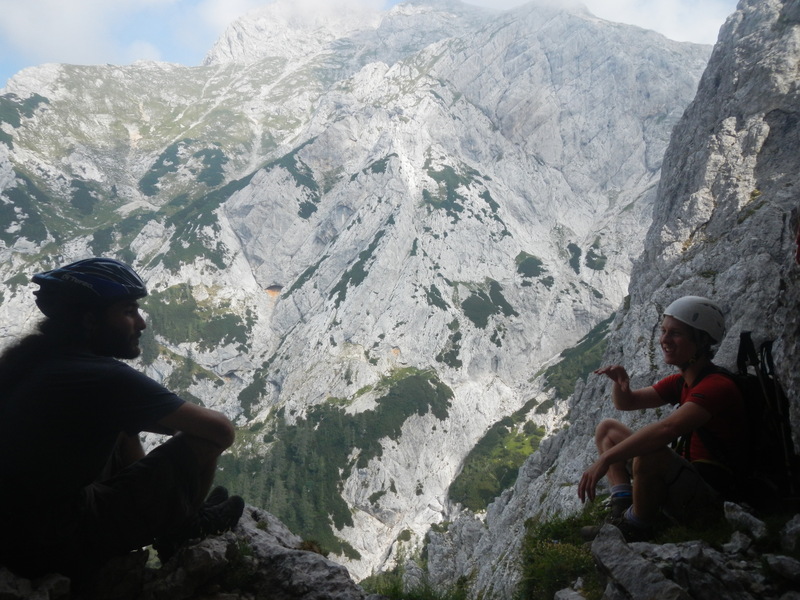 When Slovenians say that they are going to the mountains, they go straight for the top! They draw a straight line to the peak, and then they run there! I really enjoyed myself and the views were simply amazing. Thanks Uros! So with the short visit to the center of Ljubljana we thought that we had seen a bit f the most representative places of this small, but incredible country, and after three days we left. The Balkans where waiting ahead of us!